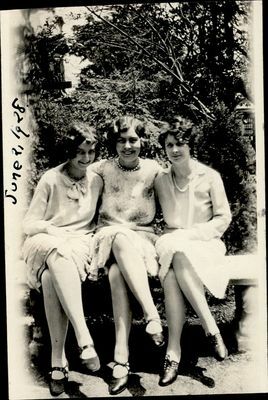 "Martha Silva, Marguerite Sargent, Dorothy Lloyd"
Martha Silva, Marguerite Sargent, and Dorothy Lloyd [left to right] pictured seated outside on a stone bench. Title taken from back of photograph. Donated by Walter E. Hurley, Sr.